Preparing healthy, home-cooked food for my family is important to me, and I’m always looking for new ways to make this task a bit easier. So I’m very intrigued by the NuWave oven. This countertop appliance uses three cooking methods—conduction, convection, and infrared heating—to cook food faster, healthier, and with less energy than a conventional oven. That sounds like the holy grail of cooking appliances to me! 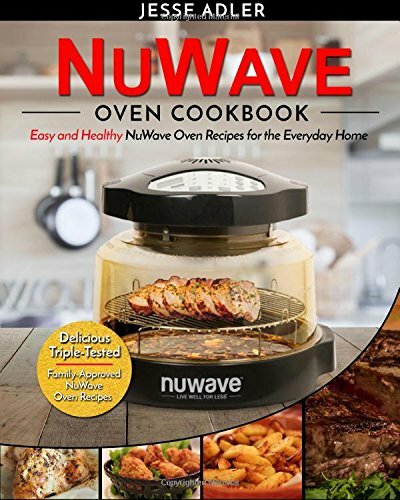 I’m curious about what the NuWave oven can really do, so I’m going to take a look at a number of NuWave recipes and cookbooks to get a sense of how this appliance works and the best uses for it. Feel free to click ahead using the links below to see the latest prices and reviews for the cookbooks on Amazon. One of the things that’s so cool about the NuWave oven is that it’s not just a single-function appliance. It can perform a number of cooking tasks including searing, steaming, baking, broiling, grilling, roasting and air frying. Therefore, you’ll find a wide variety of recipes you can make in a NuWave. It is especially good at cooking meats, as the short cook times and unique cooking method helps seal the moisture of the meat in—no dried out chicken or beef. The NuWave also gives a nice crisp finish without using lots of cooking oil, hence its boast as healthy appliance. So, let’s take a look at some of the things you can make in a NuWave. 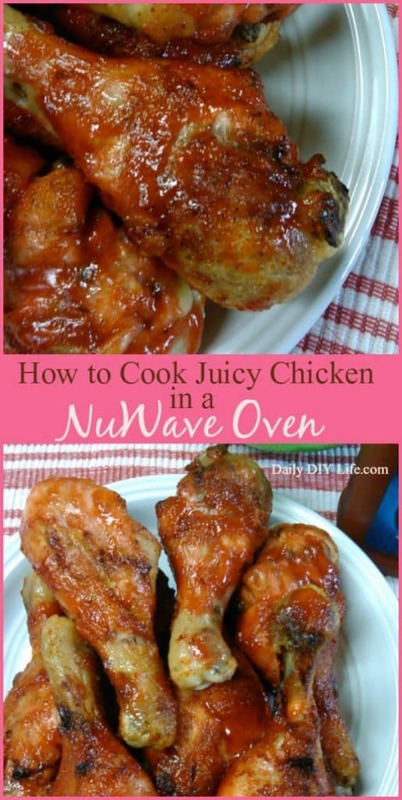 This is a general how-to recipe for cooking chicken drumsticks in the NuWave oven. It requires seasoning the chicken, cooking for 12 minutes in the NuWave, then repeating the process after flipping the chicken. This how-to shows just how simple it is to use the NuWave for chicken. As shown, you can also add a favorite BBQ sauce to the chicken to let the flavors soak into the meat while it cooks and crisps up a bit on the outside. Buffalo wings are a favorite in my house. I love to cook up a batch and serve with some French fries and a salad. This recipe explains how to use the NuWave for tasty and tender Buffalo wings by first coating them in a seasoning mix and then cooking them for about 12-16 minutes. That’s definitely an improvement from the 30-40 minutes wings usually take in a conventional oven. There’s also a classic sauce recipe to mix up while the chicken is cooking in the oven. I love lamb—such a flavorful, rich meat. The NuWave oven is great for meat, especially fattier meats, so lamb chops are a great meal to cook in the oven. This Mediterranean-inspired recipe has you marinate the chops in a simple sauce for about 15 minutes, during which time you can make the feta mixture with tomatoes and olives. After marinating, the lamb chops only take about 12-15 minutes in the NuWave. This recipe recommends spooning the feta mixture on top of the chops and letting it melt in the NuWave, but I think it’d also taste delicious unmelted. Beef ribs are another oft-requested meal around these parts. This recipe looks delicious. Orange marmelade, mustard, lemon juice, and Worcestershire sauce come together in a sweet and sour sauce to coat the ribs. The ribs cook for about 30 minutes in the NuWave. There are also instructions for cooking the ribs from frozen—very handy if you hadn’t planned ahead and defrosted your ribs! My 4-year-old loves anything that seems to be made specifically for her size. These mini meatloaves would definitely delight! You could use your own meatloaf recipe to do this, but I think this recipe sounds like a winner. She also notes that the meatloaves form a nice crust on top in the NuWave—I love a little crunch to my meatloaf, so that’s a plus in my book. Artichokes are a delightful, tasty vegetable. This casserole combines artichokes, muchrooms, sour cream, breadcrumbs and seasoning to make a zesty casserole. It bakes in the NuWave for 15 minutes. The recipe recommends stuffing this mixture into bell peppers. I think it’d also be great served as a side dish for meat, stuffed into mushrooms or chicken breasts, or served on top of crusty bread for an appetizer—a very versatile little recipe! 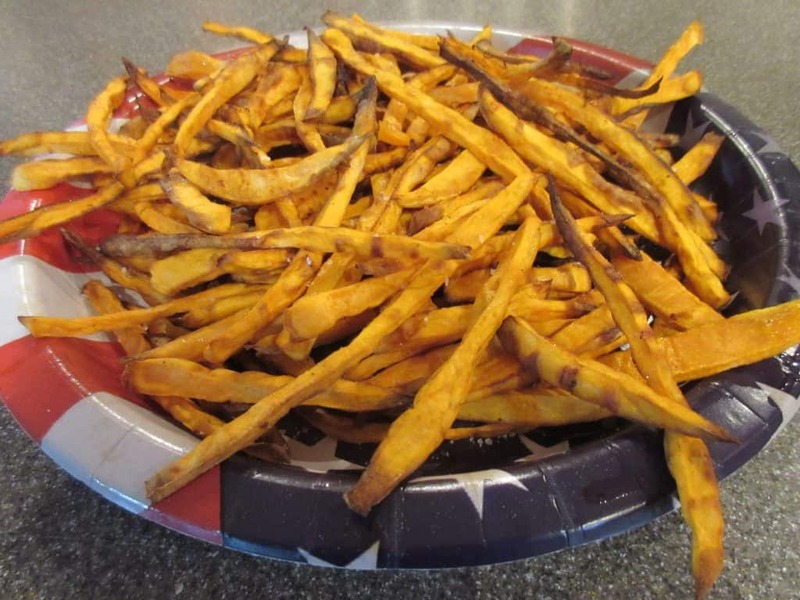 I was happy to find a NuWave recipe for sweet potato fries because I just cannot get them crisp properly in my regular oven. The NuWave is the right tool to get those perfectly crisp sweet potato fries in only about 12 minutes of cook time. As this recipe points out, you could use any seasoning you want to sprinkle on your fries, but her recipe features Flavor God Pizza Seasoning. This would make a great side dish for a number of the meals I’ve already linked here. Many NuWave users say that they use their NuWave oven nearly every day. If you’ve invested in a NuWave oven, you should get a great cookbook to make the most out of this handy appliance. Let’s take a quick look at some of the top-sellers. 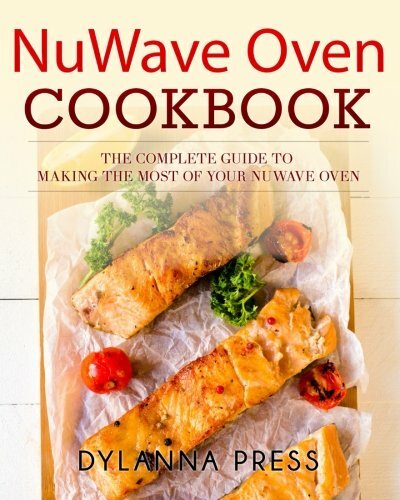 This cookbook offers a great variety of recipes to try out in the NuWave oven. I like that it includes breakfast, dessert, appetizer and side dish recipes as well as main courses, so you can really use your NuWave for every meal. Reviewers note that the recipes are simple and require ingredients that most people have on hand or can find easily in their grocery store. This book also offers a good variety of dishes to cook in the NuWave, including vegetarian mains. That’s a nice addition, since many recipes for the NuWave involve meat. This book claims to help you make meals that involve quick prep and easy clean-up, and people who’ve tested out these recipes confirm that the book lives up to these promises. 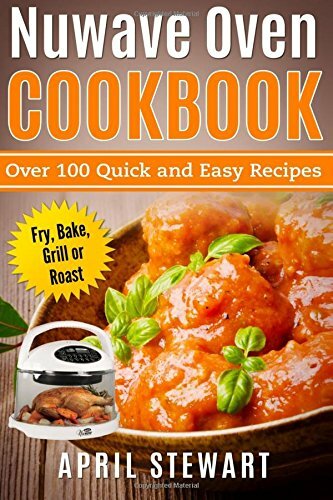 Like other NuWave cookbooks, this book includes recipes for every meal that are healthy and easy to make. This book also includes a lot of tips and tricks for using your NuWave, so you become very familiar with the appliance itself. I think this is a great addition—with some advanced knowledge, you’ll be able to expand your NuWave repertoire by improvising a bit and coming up with your own creations. This cookbook organizes its recipes by meal, offering options for all times of the day. The variety is nice and you’ll find a lot of different options that you don’t see in other books. However, reviewers note that many of the recipes require a cooking temperature that is higher than the settings on the NuWave. Therefore, you may have to play around with the cooking times to make these recipes work, which is pretty inconvenient. If you already have a NuWave oven, try out one of the recipes listed above and let us know how it works. If you really want to get the most out of your NuWave, I recommend you invest in a great cookbook. 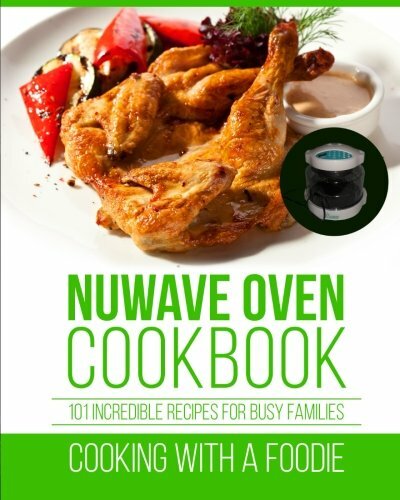 Jesse Adler’s NuWave Oven Cookbook for the Everyday Home is a great choice. Adler will teach you how to really use your NuWave, with a number of delicious recipes to test out your skills and fill your belly. Have you ever tried a NuWave oven? Share your experience below!